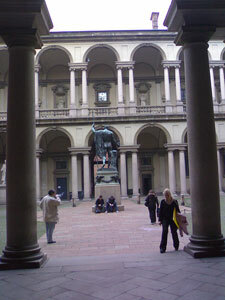 Milan is one of the main cultural centres in Italy. The modern city of Milan counts a rich cultural inheritance which people and institutions have contributed to reinforce during the course of the centuries. Today the entire city centre (and not only the centre) is full of important libraries and bookshops where it is possible to find any kind of modern or rare and ancient book. The Biblioteca Ambrosiana was founded by Cardinal Federico Borromeo and was one of the first to be opened to the public (1609). The library has a historical, literary, religious and particularly retrospective classical nature, that's to say it is dedicated to the study of the past. 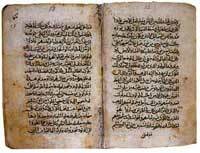 It houses a large number of codices in Greek, Latin, Vulgar Latin and various Oriental languages. The vastness of the collections, the number and value of the codices all make the Ambrosiana undoubtedly one of the most important libraries in Italy and even in the world. Inside the library you'll find the Ambrosian Art Gallery, which was founded in 1621 as an Art Accademy. The Biblioteca Sormani is the main one of the Milan's State libraries system. It is a huge library, where it is possible to find texts covering any field of knowledge and it houses a rich books patrimony, which includes humanistic, juridic and artistic texts. The entrance is free for all people over 14. 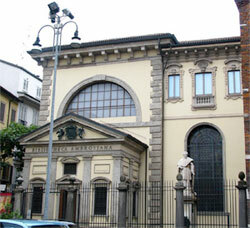 The Braidense National Library was opened to the public in 1786 in Milan. It is an important Institute covering the doble role of preservation library and mirror on the huge current Milanese and Italian books production. The entrance is free for all people over 16 (you will be asked to show an identity document with a photo at the reception desk). The library closes on December 7th (Sant'Ambrogio festivity, date of the birth of Milan's Saint patron). Here we'll list some specific bookshops located in the centre of Milan. International bookstore specialized in town planning, design and architecture. A large choice of design/art magazines and rare books. books, cd and dvd about the world of jazz. Rare texts and books about: eastern knowledge and western culture, north and south's traditions, popular mythologies, alternative medicine and science, magic and esotericism, ethnic music. books about theatre, cinema, music, dance and performing arts. bookstore-wine bar where you can find a wide range mountain publishing and a selection of the best wines of the alpine valleys. a bookstore where you can read books while listening to relaxing music and drinking a good Italian hot chocolate. fiction bookstore and literary café specialized in American literature, books about cinema and writing.